The Ultimaker CPE is easier to print than ABS and is very durable. It can be used for mechanical pieces that do not heat up and for pieces that could benefit from some flexibility. The CPE Ultimaker is slightly flexible and safer in terms of fumes and particulate emissions during printing. The CPE is fairly simple to use and was designed by Ultimaker for optimal operation of the machines of the same brand, CPE is ideal for post-production of functional prototyping because it allows the creation of prototypes that retain the shape and strength of the created object. The CPE Ultimaker is also resistant to heat because it can withstand temperatures up to 70°C. CPE is a good compromise for printing transparent pieces with the natural CPE Ultimaker. Makershop3D has selected the Ultimaker filaments which will be perfectly adapted to 3D printers of the same brand with these filaments and particularly the CPE Ultimakerbeing high-quality filaments that are suitable for printing using profiles stored in the brand machines. Moyenne établie par les clients Makershop sur 450 avis. 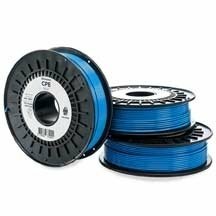 CPE filament from the Ultimaker brand produces strong prints that are resistant to chemicals and optimised for Ultimaker printers. 750g spool, vacuum packed for better storage.